Interview by Paul Greeves, photos of Rob by Steven Haywood. After many years of searching, photographer Rob Hutchinson found what he was looking for among the brooding tors and sunken valleys of Dartmoor. His delightful portraits of this vast, often mysterious landscape have brought him personal and professional success over the last 10 years. Whether it is recording the changing seasons, gambolling rivers, barren outcrops or heaven-sent light, his portraits celebrate this unique natural kingdom. But it took a moment of crisis brought on by serious illness and problems in the farming industry for this talented photographer to discover his true passion. As a result, the days and nights spent alone treading paths across Dartmoor, looking for that perfect image, have brought him closer to nature and to his Christian faith. 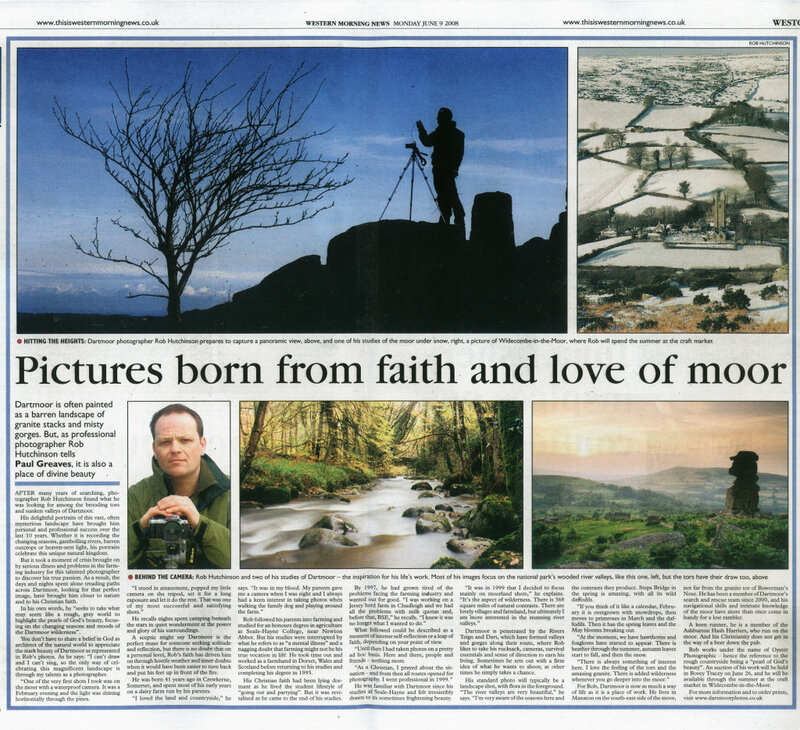 In his own words, he “seeks to take what may seem like a rough, grey world to highlight the pearls of God’s beauty, focusing on the changing seasons and moods of the Dartmoor wilderness”. You don’t have to share a belief in God as architect of the natural world to appreciate the stark beauty of Dartmoor as represented in Rob’s photos. As he says: “I can’t draw and I can’t sing, so the only way of celebrating this magnificent landscape is through my talents as a photographer. “One of the very first shots I took was on the moor with a waterproof camera. It was a February evening and the light was shining horizontally through the pines. He recalls nights spent camping beneath the stars in quiet wonderment at the power and glory of his surroundings. A sceptic might say Dartmoor is the perfect muse for someone seeking solitude and reflection, but there is no doubt that on a personal level, Rob’s faith has driven him on through hostile weather and inner doubts when it would have been easier to turn back and put his feet up in front of the fire. He was born 41 years ago in Crewkerne, Somerset, and spent most of his early years on a dairy farm run by his parents. Rob followed his parents into farming and studied for an honours degree in agriculture at Seale-Hayne College, near Newton Abbot. But his studies were interrupted by what he refers to as “a mental illness” and a nagging doubt that farming might not be his true vocation in life. He took time out and worked as a farmhand in Dorset, Wales and Scotland before returning to his studies and completing his degree in 1995. His Christian faith had been lying dormant as he lived the student lifestyle of “going out and partying”. But it was revitalised as he came to the end of his studies. What followed could be described as a moment of intense self-reflection or a leap of faith, depending on your point of view. “Until then I had taken photos on a pretty ad hoc basis. Here and there, people and friends – nothing more. He was familiar with Dartmoor since his studies at Seale-Hayne and felt irresistibly drawn to its sometimes frightening beauty. Dartmoor is penetrated by the Rivers Teign and Dart, which have formed valleys and gorges along their route, where Rob likes to take his rucksack, cameras, survival essentials and sense of direction to earn his living. Sometimes he sets out with a firm idea of what he wants to shoot; at other times he simply takes a chance. His standard photo will typically be a landscape shot, with flora in the foreground. “The river valleys are very beautiful,” he says. “I’m very aware of the seasons here and the contrasts they produce. Steps Bridge in the spring is amazing, with all its wild daffodils. “If you think of it like a calendar, February it is overgrown with snowdrops, then moves to primroses in March and the daffodils. Then it has the spring leaves and the May blooms breaking out. “At the moment, we have hawthorns and foxgloves have started to appear. There is heather through the summer, autumn leaves start to fall, and then the snow. For Rob, Dartmoor is now as much a way of life as it is a place of work. He lives in Manaton on the south-east side of the moor, not far from the granite tor of Bowerman’s Nose. He has been a member of Dartmoor’s search and rescue team since 2000, and his navigational skills and intimate knowledge of the moor have more than once come in handy for a lost rambler. A keen runner, he is a member of the Ashburton Hash Harriers, who run on the moor. And his Christianity does not get in the way of a beer down the pub. Rob works under the name of Oyster Photographic – hence the reference to the rough countryside being a “pearl of God’s beauty”. An auction of his work will be held in Bovey Tracey on June 26 2008, and he will be available through the summer at the craft market in Widecombe-in-the-Moor.